Rare breeds of British farm animals are preserved in this pioneering farm park in the heart of the Gloucestershire Cotswolds. There are daily demonstrations for visitors, and hands-on opportunities to see rare and endangered breeds of British animals up close. The farm was established in 1971 to protect rare breeds of farm animals by Joe Henson, with the core of the collection coming from Whipsnade Zoo. When the farm opened its doors to the public in 1971 it was the very first of its kind anywhere in the world. The farm is now run by Joe's son Adam, who has been called Britain's favourite farmer. Adam has been a regular on BBC's Countryfile programme since 2001. 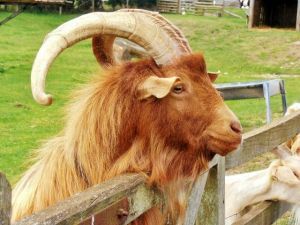 Among the variety of unusual breeds that call the Farm Park home are Soay sheep, Highland cattle, Exmoor ponies, Manx Longhorn sheep, Shetland ponies, and Boer goats. Species on show include cattle, goats, pigs, sheep, horses, and ponies. In addition, children will enjoy farmyard animals like chicks and rabbits. Visitors can bottle-feed lambs, or watch sheep being sheared by hand. You can also take a 'farm safari' ride on a tractor. Our family live just a few miles away from the Farm Park, and you can spot yellow 'Shearing Today' signs on all the nearby roads when sheep shearing is underway. There are also 'Fun Rides' where visitors bring their own horse and join a group of riders exploring the farm park, enjoying a network of woodland trails and grass gallops by the River Windrush.